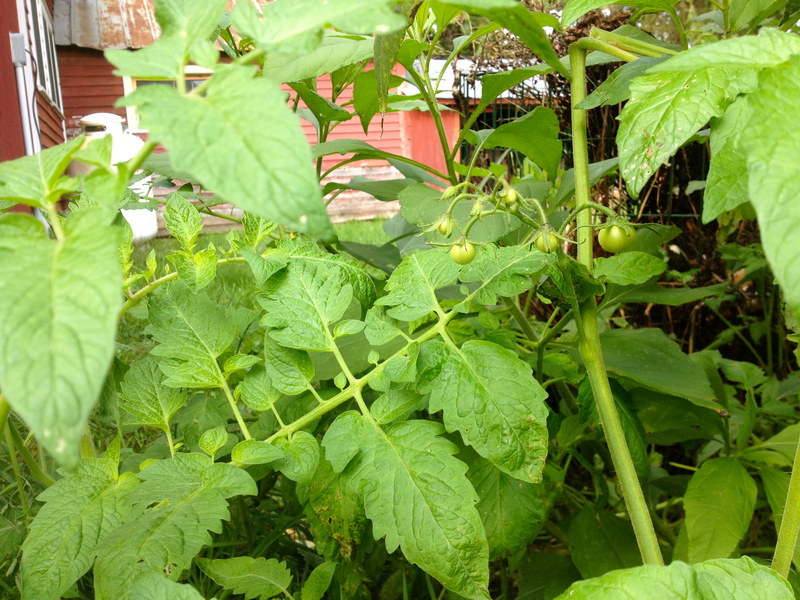 Yesterday I began taking down the tomatoes—not that they need much help from me. The heavy vines have been pulling their spindly “supports” down for weeks, sometimes ripping them right out of the earth. Greenery is browning fast, some branches shriveling to dusty nothingness while others, still juicy, play host to a dark creeping fungus. And everywhere, cracked fruits blacken, ooze, spill, stink. Tomatoland in early fall is not a very nice place to visit—so says the human. But if the plants could describe their ambition, this would probably be it. For this moment, the tender seedlings climbed toward the sky; they put out their modest yellow flowers to tempt the bees and butterflies; they dug deep, sucking water and nutrients out of the soil. All so the fruits could swell, burst, and spill their seeds back to the earth. It’s all very lovely but, alas, I have to interrupt the cycle. Those ratty vines and rotting fruits can also harbor pests and disease that will re-emerge next year, so I drag the spent plants to the back of the property, then (ick) pick up bucketloads of liquefying fruits. Every few minutes I’m startled by the sound of a pinecone falling five, six stories from the tall trees on the north rim of my property. Across the street, someone tends a grave in the hamlet’s cemetery. There are a few bright, unblemished specimens, so those go into the kitchen, but after a day spent among the dying I’ve kind of lost my appetite for tomatoes. Early summer—when I would tenderly pinch suckers on the way out of the house, then leave for work with the furry green scent of young tomato plants on my fingers—seems so long ago. Except…in the shadow of the compost pile, for a late-starting volunteer, it’s still spring. Small green fruits have only just begun to swell on the vines, which show not a hint of decay anywhere. There are even a few flowers left on the plant’s shaded backside. Sitting with it is a nice way to restore the senses after a day of less-pleasant chores. 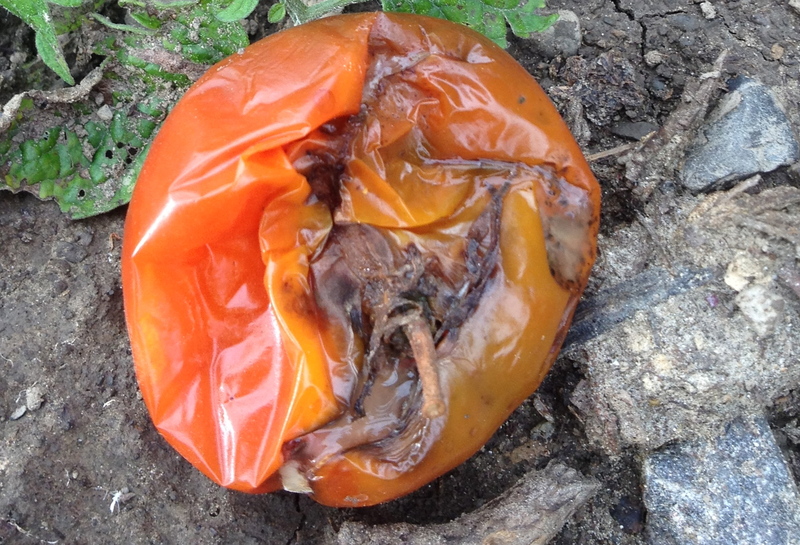 But from a tomato’s point of view, this may be the saddest plant of all, as it will most certainly be cut down by a killing frost before today’s hard green spheres have a chance to swell…color…soften…crack…collapse…spill. When I begin laying out my garden each year, I’m mentally grouping the vegetables into four families: nightshades, cucurbits, legumes, and….other random stuff. Plants belonging to one family tend to have similar nutritional needs; they also share susceptibility to some of the same diseases and pests. Keeping kin together and rotating them to a different section of the garden each year is a way to keep everyone healthier without resorting to chemicals. So I try to end up with more-or-less-equal square footage for each of these categories. But there is another category of later, one that has become more appealing as my garden has gotten bigger: the “later” vegetables that keep with little help from me, like potatoes, winter squash, shell beans. Last year I felt very smart for planting lots of these (in the nightshade, cucurbit, and legume sections, respectively). All winter long, I’ve been enjoying the fruits of my labor. So, you’d think I’d be nearing the end but…you’d be wrong. 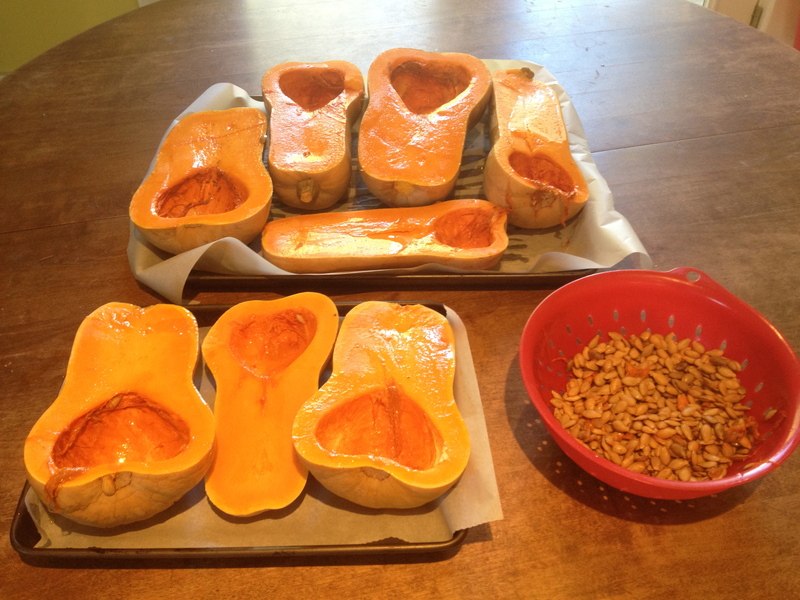 While I’m not yet to the point where I’m tired of eating butternuts, it is getting to be time for the “food storage room” to be a “guest room” again. A few days ago, I roasted as many as would fit in my oven. All of these things are good, but they do not compare with the transformation achieved last night. I went to visit a friend in the next village and brought her a nice-looking specimen, plus a few storage failures to feed her goats. She, in turn, sent me home with some just-snapped asparagus spears from her own garden. Talk about transformation! I ate about half of them on the drive home. 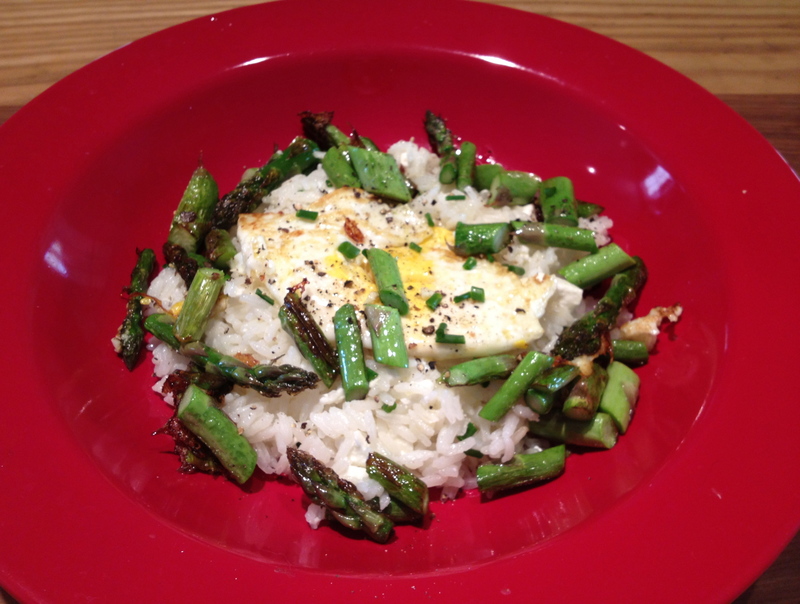 When I got home, I tossed some leftover rice with lemon, chives and feta, then topped with sosofresh sautéed asparagus and a fried egg. A half-cup of beans, sown in the soil, will likely return 30 or 40 plants, each heavy with pods of new legumes…or the same quantity can be cooked and consumed in one siting. 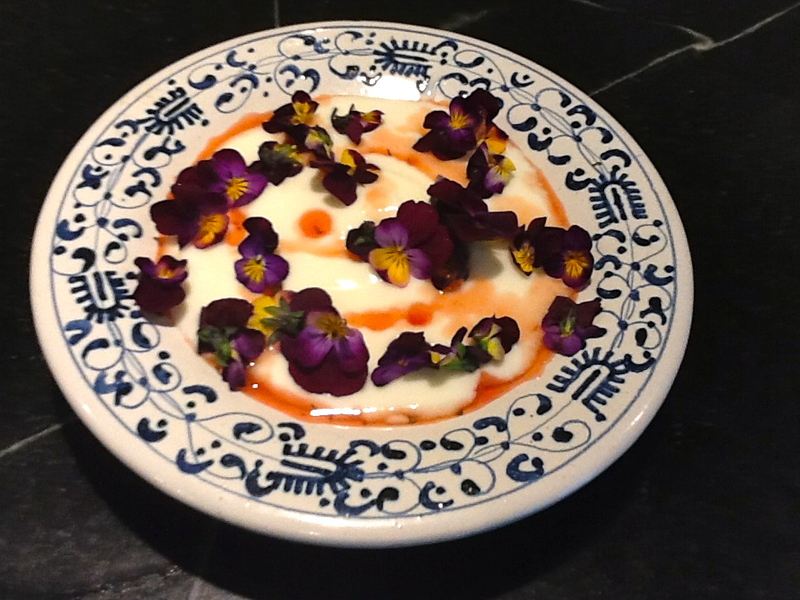 So why is it that beans for dinner gets filed under “frugal” while flowers for breakfast seems ridiculously decadent? On arrival last week, I surprised not to see bright dandelions dotting the lawn—like everything else, they’re behind schedule this spring. Since I’m late to the garden party, too, I’m OK with their tardiness; I know that once the blooms do show up, the greens turn from pleasantly bitter to tough and aggressive. I’ve been eating the greens on and off for the last week, and even though there are plenty of immature plants available for harvest, I’ve noticed the young leaves are tougher than usual—hungover and disoriented from their extra-long winter nap, they’ve come up fighting. It takes an extra measure of determination (in the form of prolonged chewing) to assimilate them. Friday saw the first splashes of yellow, which was not entirely bad news, as I’ve been wanting to try this. 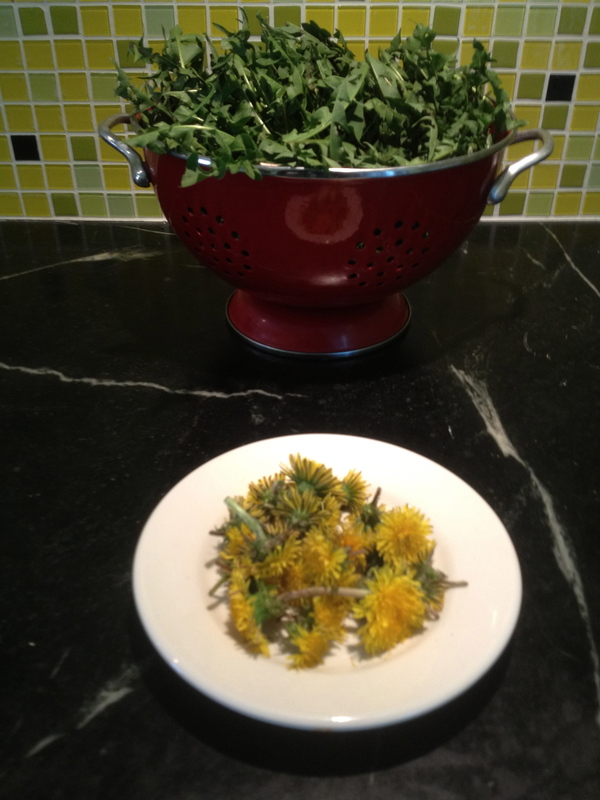 For dinner, I thought I’d prepare dandelions two ways, beginning with my standby method with the greens (slowly brown onions, add sherry vinegar, boil down while stirring with a spoon dipped in honey, add greens). After I threw the greens in the pot, I clapped on the lid, turned off the heat, and began the fritters. I didn’t have milk, so I substituted yogurt thinned with water. I also used a blend of quinoa flour and corn flour (more of the former). 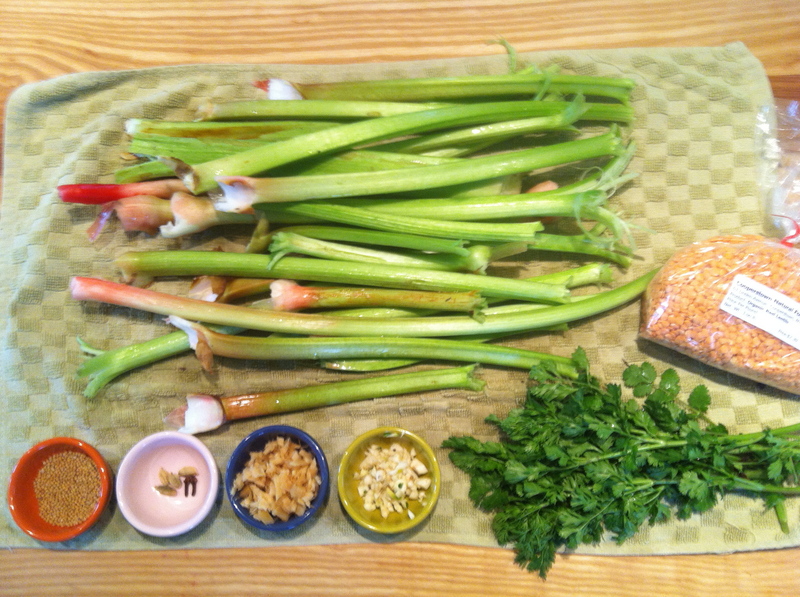 And I added some snipped chives—a brighter echo of the caramelized alliums in the greens. Dip. Twirl. Sizzle. Hmmm…. the bottoms darkened but the tops remained quite liquid. Of course I hadn’t brought the recipe into the kitchen with me, and of course I didn’t think to go upstairs and review it. Had I done so, I would have seen that the instructions say to flip the flowers. I might also have noticed that the illustrations showed stems trimmed to nothing between the time of the dipping and the finished product (although the recipe made no mention of this tedious task). Luckily, I had the oven on for something else, so I moved the fritters in for a few minutes—problem solved. They were delicious, nicely complemented by some of last year’s pickled beets, but too fussy to repeat anytime soon. 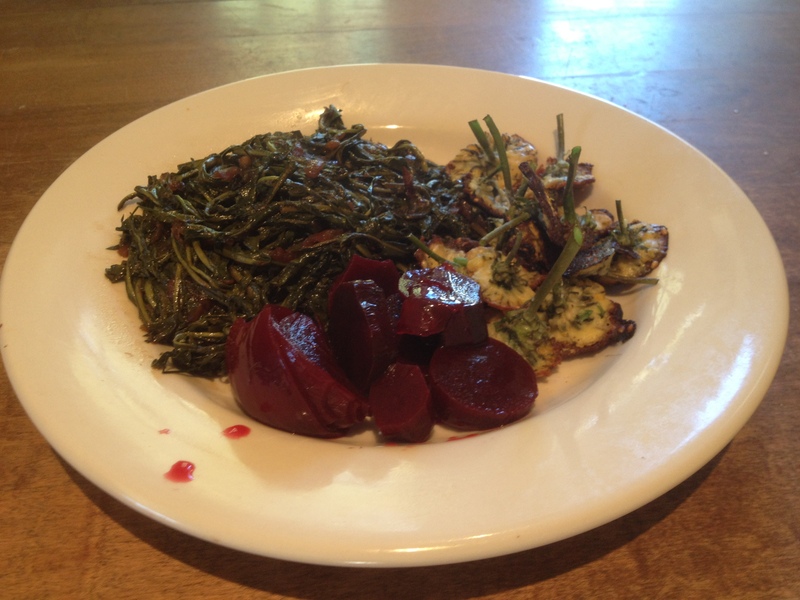 The next morning, I added a chopped handful of dandelion greens and some sesame seeds to the leftover fritter batter. I probably would have had better luck if I had tried several smaller fritters instead of one large one (which fell apart). 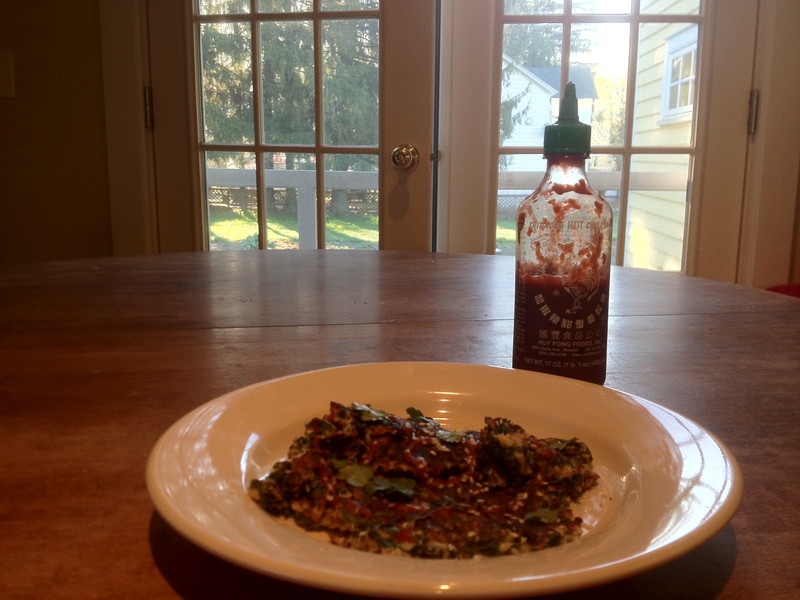 Not exactly what I had pictured when starting out, but once doctored with some sriracha, sesame seeds and cilantro, it was a great start to the day. Once, I saw dandelions only as unwanted competition for the plants I chose to tend and did my utmost to eradicate them. But after a couple of years of wrestling with the green-and-gold bullies, I found some respect on the flip side of my annoyance. These “weeds” are masterful in their employment of two opposite, yet equally successful, survival strategies. With their hairy taproots, they dig deep; at the same time, their achenes—aided by aerodynamic pappus—have perfected the art of letting go. My admiration hasn’t stopped me from trying to rout them from my garden, but I’m no longer so hard on myself when I see that familiar cluster of jagged leaves emerge….again. I know that their will—and skill—for survival is far beyond my feeble attempts at suppression. These last weeks, I’ve been daydreaming what I’d find when I could finally quit the city and revisit my garden. Usually I’m able to make a few quick trips as the long dormancy ends and spring’s slow unfurling begins, but not this year. From some 200 miles away, I imagined the rhubarb and asparagus (asparagi?) poking their tender heads through the soil and slowly turning woody in my absence. I remembered the thousand coriander seeds dropped during last fall’s sloppy harvest, undoubtedly sprouted by now. I wondered if the strawberries had survived their first winter. I hoped the apple blossoms would not get nipped by this year’s late, late frosts. I accepted the inevitable march of weeds across the expanses I cleared last fall. Finally, on Thursday, I made my move, only to discover that my mind had raced ahead of reality, as usual. Spring is only just coming to Otsego County. I had to brush some soil aside to find the pink, furled rhubarb heads. There’s no sign yet of the asparagus, or even the semi-invasive coriander. Since the apple trees are barely budding, there have been no blossoms to nip. Even the weeds are slightly disappointing. I’d wanted to get the first seeds into the ground as quickly as possible, so the lack of activity seems like a good thing. But once I get a little closer to the dirt, I find that there are lots of things that need attention first. The weeds may be small, but they are already more plentiful than I’d realized. As usual, the earth has heaved up a new crop of rocks, which must be cleared. The creeping mat of daisies is edging into peony territory. And there are pleasant surprises that call for a grateful pause: The wild arugula is back, as is the lovage, sorrel, horseradish. A few “biodegradable” stakes, undegraded so far, can be retrieved and reused. Overwintered parsnips can be dug for dinner. There’s also cleanup indoors. Most of the remaining storage onions have fed upon themselves to the point of collapse by now; I salvage three and compost the rest. Potatoes, too, have begun reaching their weird tentacles forth as they plan for the next generation; while they’re still edible, many of them will need to go back into the garden in a couple of weeks. 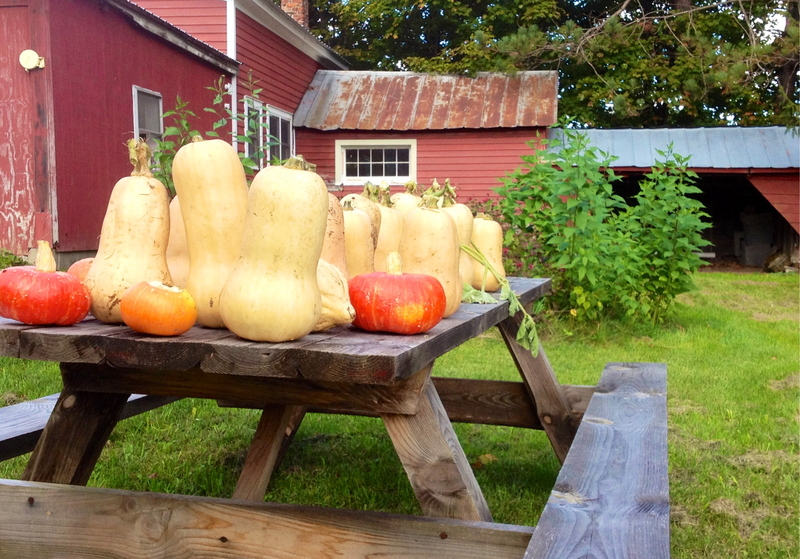 A couple of winter squash have succumbed to mold, but 12 are pristine—I’m going to have to work hard to get through those before the garden starts really producing again. (Gnocchi, perhaps? And definitely fewer butternut vines in this year’s garden.) And there’s all the food in jars, but I seem to be making pretty good progress there. The many pickles will get me through the days of beans and rice, and sweet preserves make a nice accompaniment to morning oatmeal. Yesterday evening, after several days of labor, I was finally ready to begin putting a few things in the ground: bunching onions, two kinds of greens, peas, radishes, beets, turnips. Overnight, a soft rain tamped them down into their clean new beds and created just enough muck to give me the day off. My mind continues to run ahead, but the garden will happen in its own time—as it always does. Although I’ve been at this gardening thing for seven years now, I still haven’t acquired the ability to start seeds indoors in the spring. Or perhaps it’s more a question of will than ability — who wants to mess with potting mixes, lights and timers, temperature gauges, hardening off, and the like? Some of my friends do, which is all the more reason not to bother. Yesterday, after a lovely lakeside lunch with just such a friend, he presented me with nine healthy young crucifers, plus a bag of just-picked asparagus. I had planned to spend the afternoon writing, but those adolescent plants, each confined to a single shot of soil, clearly needed to go into the ground. It took more effort than I expected to clear a space east of the rhubarb, north of the strawberries, south of the peas. By the time I was done I was too dirty and tired to write, so I figured I might as well give the rest of the daylight to the garden. Taking a break from intense physical effort, I turned to the fiddly task of weeding the crops I had planted in the early spring — strawberries, radishes, snow peas, kale, parsnips. Then it was time for asparagus. A perennial, asparagus requires a large initial investment of time and effort but then rewards you with years of production. I’ve been around the block with asparagus once before, but just before the long-awaited first harvest, the plot met a tragic early demise, due to a miscommunication with the friendly neighbor who plows up my garden every year. It took me a few seasons to get over the loss, but this year I was ready to start again. The good news: now that I’ve been working this plot for a few years, it was much easier to dig the trench for the crowns. Not easy, mind you, but easier. I love how, on television cooking shows, a dish goes into the oven just before the commercial break, and then just a few minutes later the host is enjoying a fully cooked and beautifully plated version. I felt the same kind of magical cheat when I walked inside from planning my asparagus — which will not be ready to harvest until three years from now — and enjoyed garden-fresh asparagus for dinner. 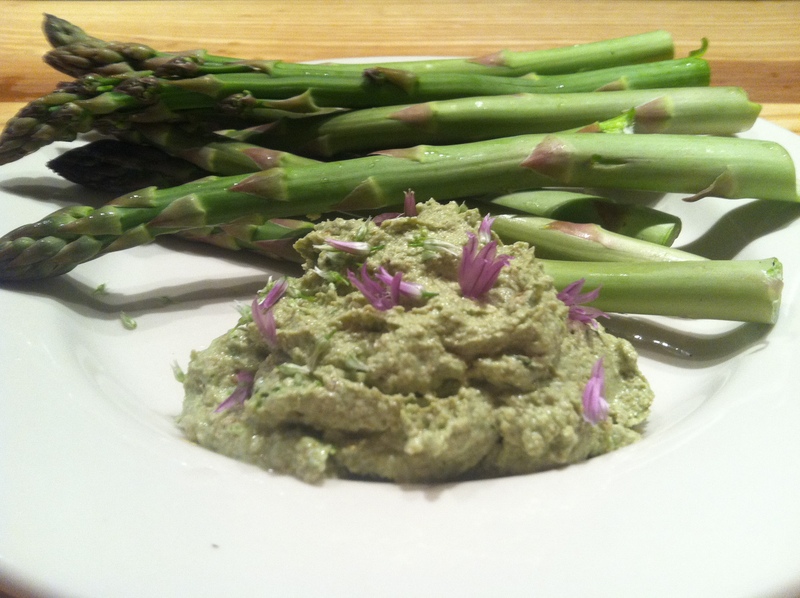 Grassy-sweet and tender, these fat spears required no cooking, just a little boost of protein. I decided to make a reverse pesto: instead of fistfuls of herb with a little bit of nuts, into the blender went a pile of almonds with a small amount of wild arugula, chives, green garlic and tarragon. To get things moving I added some olive oil and lemon. It was delicious, but about halfway though the afternoon caught up with me… I was, literally, too tired to keep chewing. I finished the almond stuff with a spoon, then I tucked the asparagus into the fridge and myself into bed. But a few months ago I came across this recipe, and I’ve been looking forward to rhubarb season ever since. After gathering some rhubarb and cilantro yesterday, I thought about toying with the spice mixture but then decided, just this once, I would try the recipe exactly as written. Well, almost exactly — I love Mark Bittman’s tendency toward simplification, but I find it really does make a difference if you sizzle your spices before adding them. It was not too much extra effort to pop the mustard seeds in a little oil before proceeding with the recipe. The rhubarb dal went so well that I thought I’d try another recipe (two in one day!). I’ve been reading a great cookbook called Bean by Bean, and I imagine I’ll be making many concoctions inspired by the recipes therein once we hit bean season. For now, though, I’m really glad to have come across a recipe for injera, the Ethiopian flatbread. Injera serves as a base for stew-like foods, as well as a simple utensil. As it turns out, it couldn’t be easier to make: 1 ½ cups water, 1 cup teff flour, 1 teaspoon yeast, left to ferment for 12-48 hours and then griddled. 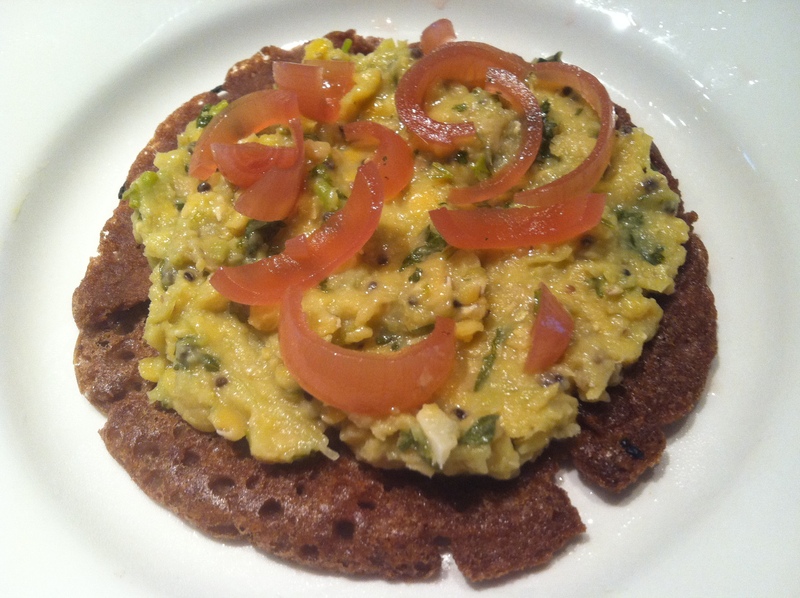 For breakfast this morning I had injera spread with leftover dal, garnished with last year’s onions, pickled with beets, maple syrup, cardamom and ginger. Yum. Rhubarb appears like a gift in early spring, after a winter of neglect, but then requires some serious attention to get it from the plot to the plate. It’s just as well, really, since I have plenty of time to mess around in the kitchen at the moment. The ground is still too wet to work, the weather still a bit too cool to plant most summer vegetables. Once those crops go in, they will require a sustained effort to bring them to harvest, but once picked, they’ll need only the simplest of preparations. Thank goodness. 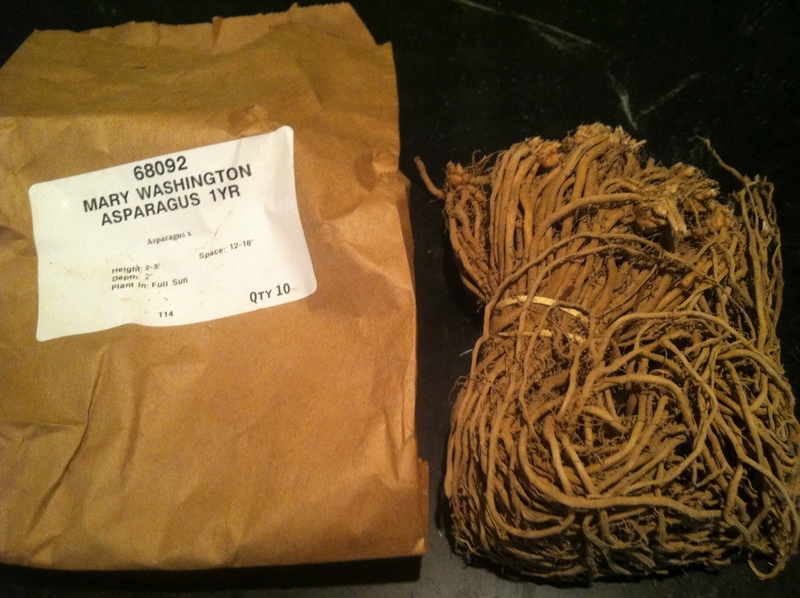 in the bleak midwinter… and still eating local!